Heat the oil in a large pan. Add the chicken, all the spices, and the onions. Cook over low heat for about 8-10 minutes until the chicken is cooked through and the onion has softened. Add the carrots, turnips, red kidney beans, crushed tomatoes and tomato paste. Season with kosher salt and pepper to taste. Pour in the Manischewitz® Chicken Broth and bring to a boil. Stir well. Cover and reduce the heat. Allow the soup to simmer for about 30 minutes, stirring occasionally. Add the Manischewitz® Fine Egg Noodles and return to a boil. Cook the noodles for about 5-6 minutes until al dente. Remove from heat. Stir in parsley and serve. 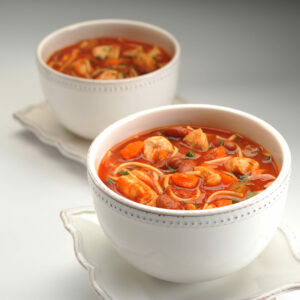 Tip: For a healthier version, use our Reduced Sodium Chicken Broth instead.